The introduction of a completely new engine is an exciting event for those of us prone to fixing things that ain't broke. Toyota's new 1ZZ-FE engine, debuting in the 1998 Corolla, has cleaner emissions and better fuel economy than the 7A-FE it replaces, but thanks to some engineering resourcefulness, it also has increased power and appears to have potential for more. The "1" in 1ZZ-FE means that this is the first of the ZZ engine family  a clean sheet design. Displacing 1.8 liters, it is rated at 120 hp, up from 105 on the 1.8L 7A-FE. 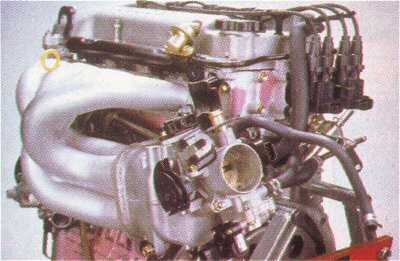 The 1ZZ-FE is a relatively long stroke engine, with a 79mm bore and 91.5mm stroke (that's 2mm smaller bore and 2.5mm longer stroke than a non-VTEC Integra). The engine was originally designed to be a direct-injection engine, but the high sulfur content in American gasoline makes it impossible to build a clean-burning direct-injection gas engine with current technology. They work fine on high-quality (and expensive) Japanese gas, but they won't fly here...yet. The 1ZZ-FE has an open-deck, die-cast aluminum engine block with cast iron cylinder liners. 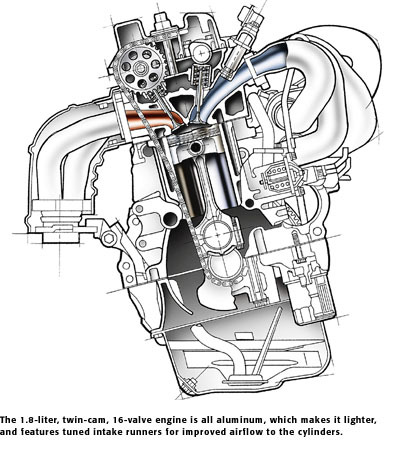 The open deck (meaning the top of the block is open to the coolant jackets) is a disadvantage for cylinder strength if you are planning on having very high cylinder pressures (e.g., turbocharging). Honda engines are open deck designs as well. (hmmm...) On the bright side, there are successfully turbocharged Honda engines out there. The advantages of an open deck design are its lighter weight and the fact that it allows the block to be die cast. A closed deck design, with its more complex, enclosed water jackets, has to be sand cast. Sand isn't a very precise material, and the sand cores can shift during setup or casting. Sand cast parts must have larger tolerances designed in, and more machining is required for gasket mating surfaces, bearing surfaces, and anything else that has to be in exactly the right place. The open-topped water passages, on the other hand, allow the block to be cast in a more precise metal die. Another significant design feature of the block is a full-size main bearing girdle. The bottom of the block ends at the centerline of the crankshaft, and an aluminum bearing girdle with cast-in-place iron main bearing caps bolts to the bottom of the block, strengthening the bottom end considerably. 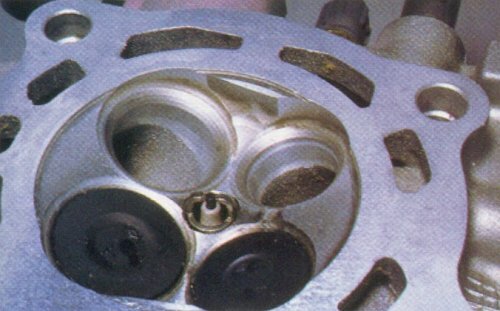 The 1ZZ-FE's head is an elegantly simple 16-valve twin-cam design. The combustion chambers are designed with a generous amount of "tapered squish area." Squish area, or quench area as it is sometimes called, is the flat area around the combustion chamber that is critical to knock-resistance and combustion efficiency. When the piston approaches the top of the compression stroke, the gasses trapped between the squish area and the piston are forced toward the center of the combustion chamber. This high-speed shot of air and fuel help to ensure quick, even combustion. On the 1ZZ-FE, this concept is taken one step further with what Toyota calls tapered squish area. 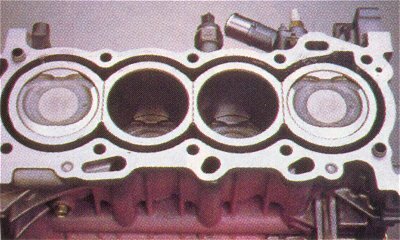 Instead of being flat relative to the head gasket surface, the squish area is machined at just the right angle to be in line with the spark plug. When the matching machined surface of the piston comes up, air and fuel are shot directly at the spark plug, improving the chances that ignition will occur as planned. Compression is a relatively high 10:1, especially considering that the 1ZZ-FE is designed to run on 87-octane gas. Toyota claims no performance benefits from using higher octane fuel, so tuning is probably pretty conservative to avoid detonation. Some power may be hidden away in the ECU if you re-tune it for 92-octane gas. ROM-tuning Toyota ECUs tends to be relatively expensive, but in this case, it may be worth it. Another innovation in the area of the combustion chamber is the valve seats. These are typically hardened-steel inserts that are pressed into the head and then machined to match the seating surface on the valve. The 1ZZ-FE, though, has "laser inlaid valve seats" that are sprayed onto the head surface with a "raygun" device. The advantage of laser-inlaid seats versus pressed-in seats is surprising. The sprayed-on seats are only one-quarter the thickness of an equivalent pressed-in seat, so the heat transmission path is shorter. This makes it easier for the valves to shed heat into the cylinder head through the valve seats instead of through the shaft of the valve. On the outside of the engine, the most obvious innovation is the intake manifold. First of all, it's on the front of the engine instead of the back as it was with the 7A-FE. The in-at-the-front, out-at-the-back layout is advantageous because it allows the catalytic converter to be placed close to the engine for fast light-off but outside the engine compartment for lower underhood temperatures. 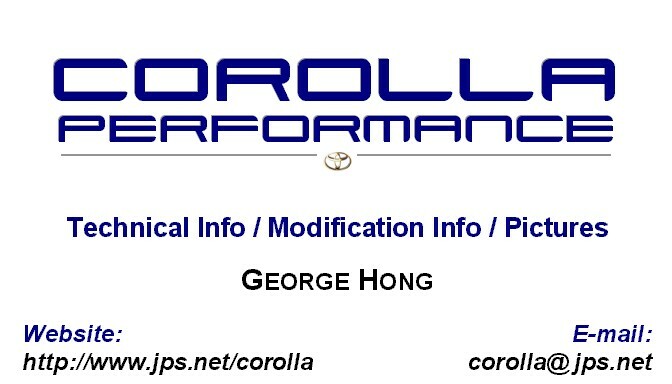 Long intake runners benefit low-rpm and midrange power, the areas most important for a mass-market car like the Corolla, but designing a good, long-runner intake manifold at the front of the engine is usually difficult. This is where Toyota engineers had to get creative. 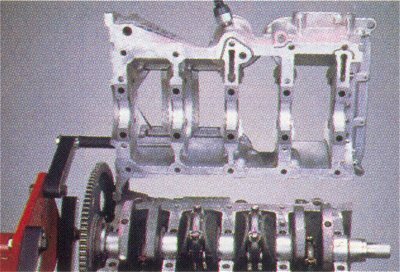 Instead of the standard cast-aluminum manifold with four parallel runners being fed by a pretty-much-cylindrical plenum, they built what looks like an exhaust header. Four equal-length, extruded aluminum tubes are welded to a die-cast aluminum flange and are fed by an odd-looking squarish plenum. From a tweaker's point of view, the design is interesting. The extruded aluminum runners have a much smoother surface finish than cast aluminum and are generously sized. Looking at the manifold up close, there are probably only two things that can be done to improve the intake manifold's performance. First, the intake runners are rather sloppily welded to the flange from the inside. The weld is a large, uneven bump all around the inner circumference of the intake port right where the manifold meets the head. Smooth out the weld, and intake flow should improve. The other obvious restriction is the throttle body, which seems quite small for a 1.8L engine. Some caution is in order here, though, since the idle air control valve and manifold air pressure sensor are both built into the throttle body housing, so boring it out too much may break open some cast-in air passages. On the down side (possibly), the extruded intake runners are thinner than cast runners, so drilling and tapping them for direct-port nitrous might be difficult. Welding on a small mounting boss may be necessary. On the other hand, the manifold is much more accessible for this work than it would be if it were on the rear of the engine. On the exhaust side, the exhaust manifold is a very short, four-into-one tube header. The primaries are too short for proper pulse tuning, and that's not likely to change due to the close proximity of the catalytic converter and the fact that there is a flex joint right after the collector, making building a header any better than the factory piece quite difficult. As catalytic converters move closer and closer to the exhaust port, there will be fewer and fewer headers available for new engines. Aft of the header, there is another tuning complication. The catalytic converter is welded to the exhaust pipe, so cat-back exhausts will either be a muffler-only affair or will have to be a cut-and-weld installation. On the plus side, the exhaust pipe appears reasonably free of restriction, so a muffler-only exhaust may be good enough. Finally, another emissions related change is the fuel rail design. Stricter evaporative emissions regulations are being phased in, and one of the relatively easy ways to reduce evaporation of unburned fuel is to keep it cool. Most fuel systems pump fuel up to the fuel rail, and to maintain the proper pressure, a fuel pressure regulator on the rail bleeds off fuel as needed. In this case, the fuel constantly circulates up the engine compartment and back to the tank. To reduce tank temperatures, the 1998 Corolla uses a returnless system where the regulator is in the tank right next to the pump. All the fuel that goes to the fuel rail goes into the engine. What this means is that you can't mess around with fuel mixture by simply using an adjustable fuel pressure regulator. You have to go inside the ECU to really do any good. Overall, the thorough redesign has resulted in an engine that is 27% lighter (70 lbs.) than the engine it replaces. The rated output seems low at first, but from inside the engine, the design seems to have its potential. Mod it, I say! Hang on, the next generation 1ZZ-FE, used in the new base-model Celica GT and MR-Spyder, is equipped with VVT-i on the intake cam, pushing power output to 140hp. Swap candidate? Perhaps...but check out the new 2ZZ-GE first before you make up your mind.